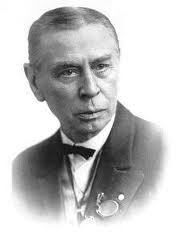 20th c. Lutheran theologian Robert Preus – a man who knew TSSI. What is TSSI? Read on. “Whoever believes in the Son of God has the testimony in himself. Whoever does not believe God has made him a liar, because he has not believed in the testimony that God has borne concerning his Son.“ — I John 5:10-11. 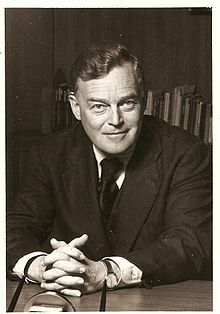 In a previous post called “History and the Foundation of Christian doctrine” I looked at a piece the Lutheran theologian David Scaer wrote, where he talked about the different approaches he and the late Robert Preus, another Lutheran theologian, had regarding matters of Christology. Scaer discussed some of the differences he saw coming out of this, particularly how the matters of history and divine inspiration were treated. As was implicitly noted in that post, it seems that Scaer locates the Scriptures within history – emphasizing their human aspect – and that Preus locates history within the Scriptures, emphasizing their divine aspect. Surely this is an oversimplification, and I invite those who can speak more fulsomely and intelligently here to weigh in. Both of these men, or course, would see the Holy Spirit at work in the process of giving the church the inspired Scriptures in time, guiding men into all truth. Going along with this, I note that in Jesus Christ and the Scriptures that reveal Him there are a couple things that are held in some kind of tension: the notion of mystery (“who can know the mind of God?”) and certainty (“you will know”) as well as the discontinuity and continuity of the Old and New Testaments (Augustine: “new in the old concealed, old in the new revealed”). In this series, I am going to explore more the certainty of faith (both the faith and personal faith) and the continuity of the Testaments. This is not to deny the other two factors – mystery and discontinuity – but is, admittedly, to find both of these firmly embedded within the former. My hope is that this preliminary series can be a bit of a spark in the promoting thoughtful dialogue among Christians, particularly to those holding to the distinctives of the Reformation. “Over and over again, with the help of several checks and balances, we are told to test God’s revelation to us. To be reminded of just a few of these, potential prophets are to be tested according to their own predictions (Deut. 18:21-22)….. God could have simply sent his listeners his Word, but he apparently did not think that these challenges to look at history were improper references to an authority above his written revelation. I must start with authority – Authority. If a person believes that they should give serious attention to religious and spiritual things – perhaps asking questions like “has God spoken?” – they will, sooner or later, realize something…. 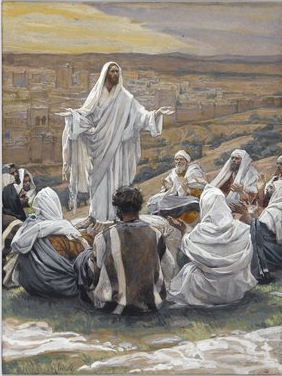 Yes, Jesus spoke with real authority. And yet, so, evidently, did Confucius. And the Buddha. And Mohammad. And even Joseph Smith. And while there might be some overlap here and there, the teachings of these men also contradict one another wildly at important points. If and when we become aware of this – particularly in this pluralistic day and age – many of us might find ourselves asking: which of them speaks the truth – or at the very least, gets closest to the truth? How to really know? Things become more complicated when we come to understand that many of these teachers often talked about how people could know that what they said was true by an internal self-attestation of sorts. In other words, when listening to their authoritative-sounding words – words often later put down in authoritative writings – one will feel it in one’s heart. That is how the truth will be known. Some of these teachers – even Jesus Himself – add that one can know whether the teaching is from God when one puts it into practice (see John 7:17). We will look at that in the next post, but permit one more brief note at this point: even many Christians here might ask “but what about our own capacity to verify what authorities might be telling the truth”? This is a good question, and we can briefly address it at this point. First, it is helpful to look at an interesting illustration demonstrating the stakes of what is involved. Going along with this, another good question is “which boats should I look at first”? Here, one notes that of all the religious leaders in the world’s history, there is only One who is claimed to still live – not only spiritually, but physically. Might this not be highly significant, given that one of the most significant man’s great questions is “Why do we die and what follows death?”**** Of course the Christian faith is unique in this claim of its founder’s overcoming of death – and His claims to have its final answer – and also opens the way for historical investigation into the matter (see Acts 2, 17 and 26 regarding this matter). As Jesus’ disciples said concerning him: “Come and see”. While the Scriptures would assert that you are not able to give yourself true spiritual life, you certainly can decide to put yourself in the path of the One who can. * De doctr. Christ, bk. 1, c. 37, quoted in Gerhard, On Holy Scripture, 2009, 58. Note the following from the Enchiridion of Erasmus, Luther’s “skeptical” opponent: “All Holy Scripture was divinely inspired and perfected by God, its author…divine Scripture…contains nothing idle…Believe none of those things which you see with your own eyes and handle with your own hands to be as true as what you read there. It is certain from the divine words that heaven and earth will pass away…Although men lie and err, the truth of God neither deceives nor is deceived.” (Spinka, Advocates of Reform, Library of Christian Classics, Philadelphia, Library of Christian Classics, 1953, XIV, 303-305) Luther: “The Holy Scripture did not grow on earth”. In other words, this message the Spirit brings and works through is in, but not of, the world. It is, in a very real sense, always the word of God before it is the word of any man. “In order to avoid circular reasoning, a Roman Catholic must provide good reasons for another to become Roman Catholic apart from reasons that assume Roman Catholicism. This is basic argumentation: one cannot present evidence that points to a conclusion assumed by the evidence. This means that a Roman Catholic must assume a theoretical position of neutrality when presenting evidence. Or, to put it differently, he must theoretically suspend his belief in Roman Catholicism to put it on public trial. Evidence must be “public evidence”: it must be offered as evidence from a standpoint of neutrality toward that which it aims to support. Stated differently, public evidence or a public reason to believe is something that does not simply provide the presenter internal consistency, but provides the person to whom it is being presented evidence that does not demand one presuppose the question at hand. In other words, it demands a theoretical neutral position. This might be startling to people of faith, but that is how argumentation works. 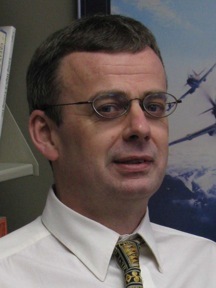 Again, I note that whether it has to do with Scripture and tradition, free will and predestination, clergy and laity, trust and unconditional obedience, preaching and the sacraments, and high worship (Eastern Orthodoxy) and low worship (Pentecostalism), ceremony and “real life”, presuppositional and evidential apologetics, Lutherans almost always seem to be right in the middle, both/and-ing it all (more on this at my post commenting on a Jonathan Fisk talk: “I’m a Lifelong Lutheran But…”) – with persons always struggling to stay in the saddle. There never will be a “perfect church”, but perhaps all this should give us pause? What is it really that everyone is looking for but not finding? *** It is not so much that TSSI actually provides knowledge or content, but rather that it adds certainty of credibility to knowledge, doctrine, simple statements of truth, Scripture, etc. In some ways, it is kind of like the certification that Microsoft developed. Here is an explanation of that from Internet Explorer: “A public key certificate, usually just called a certificate, is a digitally-signed statement that binds the value of a public key to the identity of the person, device, or service that holds the corresponding private key. One of the main benefits of certificates is that hosts no longer have to maintain a set of passwords for individual subjects who need to be authenticated as a prerequisite to access. Instead, the host merely establishes trust in a certificate issuer.” (credit to Martin Noland for this illustration). Basically, we can say that the TSSI is a “certificate of authenticity” that: 1) the believer is a child of God; 2) Scriptures contain God’s voice (i.e., are inspired); and that 3) God alone is the most proper witness as to what is his teaching (i.e., that God witnessed to his approval of prophets, apostles, and Jesus through miracles and other direct events). This three-fold view is found in the 16th century Lutheran theologian John Gerhard, in “Nature of Theology,” commonplace 1, chapter 3, section 36. See the last footnote to part II where for the quotation from Gerhard. To any FiveTwo folks reading this, I first need to set some context…. NO, PEOPLE ARE NOT THE GOSPEL! No one can believe in you and I and these five-two folks to inherit eternal salvation and be forgiven of their sins! The Gospel is the Good News that Jesus Christ, true God and true Man, lived a perfect life in our place and died on the cross for us to pay for our sins. By God’s grace alone, Jesus took our sins upon Himself and put them to death, so that we would not have to stand before God in His wrath and anger, but could stand before Him in confident trust as His dearly beloved children who are redeemed by Jesus’ blood. THIS ALONE IS THE GOSPEL. And the five-two group by this quotation does not understand it…. This is most certainly true. Just like we can’t say we are sacraments (even if we can, and should, as Pastor Stuckwisch says, live a “Sacramentally Shaped Life”). Of course we cannot talk this way and I don’t see how we can avoid saying that the FiveTwo group should simply disown such statements (but this was a tweet from a layperson and I believe the context of the quote was also explained on another post [it was – see here]). Even if there were a serious theological case someone would want to make here about us being sacraments (which the group clearly does say) – perhaps akin to the whole “ordination is a sacrament” idea – this simply introduces confusion. I hope they believe you, trust you, when you say that! Still, here we would be right to say that they are not really “believing in you”, but believing in the one you point to. So this is a fine line where we should be careful: here, we need to admit that while men will fail us and God never will, we still do trust men… even trust in men… even as we must finally NOT look to them alone… “Believe *in* them” in this sense. So why must I challenge FiveTwo? Because we trust in God who has used reliable men in his plan. Men who value the truth and tradition handed on. Men who respect those who desire to hold tenaciously to the “old time religion” – and to engender love for it and to pass it on – because it so beautifully and wonderfully adorns and carries the truth. Because brothers, I agree with you, we must trust men… But the men I want to trust more than any other men are those who really, really want to take seriously the faithful brothers who have gone before us, and paid the prices they have paid to give us the treasures we have received…. I want to trust men. I want to trust my brothers. Even as, yes, ultimately, I trust no man but God. Because of God, there is no one on earth who should be able to trust men as much as Christians do. This is the way it should be. Are you willing to listen to me a bit more? UPDATE: I thought it was possible that some persons reading this post might find this research study interesting: What Does An American Evangelical Journeying Into Confessional Lutheran Thought Look Like? The other day on this blog John Bugay mentioned that when he was leaving Roman Catholicism, he was “looking for the history of others who had left it as well”… but that “most of the historical writings [he] was finding were coming out of the Reformed tradition”. To this effect, he recommended Lutheran Pastor Jordan Cooper’s excellent show about Lutheran theologians in America (explaining, why, for example, there are so few). Naturally as a serious and convinced Lutheran, I would like to second John’s recommendation. In fact, I promptly forwarded John’s post to all the members of the theology department and a few others at the Lutheran institution of higher education where I work, so helpful, constructive and unique did I consider Cooper’s analysis. Finally, Issues ETC. also recently had a very interesting interview with a man who had been deeply immersed in the Baptist faith and church life (if he was not a Calvinist Baptist he deeply appreciated them), but who recently, in his sixties, converted to Lutheranism. I found this interview with Dennis McFadden – who incidently has five adult children who are actively involved as church workers or lay persons in Evangelical churches – particularly fascinating, and of course, reaffirming (as I am sure persons of other denominations or religions do when they hear stories of persons converting to their faith). I don’t know how many persons here are like me, but I really enjoy listening to conversion stories – regardless of who is converting from what to what. For a long while, I listened to EWTN’s Journey Home program – at least with the guests that I thought might have particularly interesting stories to tell and reasons to give. Again, I find it tremendously engaging to see how person’s views do change over the years and the reasons that they give for them. Even though listening to a variety of these stories without other input might hopelessly confuse a person, I think that with other study such stories have the potential to be tremendously helpful. If you are aware of good places to go for other interesting conversion stories that you would like to share, please post those in the comments below. Perhaps you might be particularly interested in directing me to conversion stories of persons moving from Lutheranism to Calvinism. Or, if you are a Roman Catholic reader, from Lutheranism to Roman Catholicism (though I probably have already heard the story!) If so, please do share. I would be very interested in listening to some of those stories. * I realize some might want to say: “Why not have a guy who is still Calvinist on to talk?”. I think that would be interesting as well, even as I would hope Pastor Wilken would then also ask some tough questions! Every time I see a book on apologetics by Lutherans, my pulse quickens a bit. There is no doubt that this is an area where we have not been as strong as we could be, and so I see apologetics as an important issue for Christians to be aware of and understand, at least to a some degree. This book is truly worth the read and I think it has something that will interest most everyone – even those perhaps not particularly interested in apologetics. I especially appreciated the chapters by John Bombaro and Angus Menuge, “The Scandal of Christian Particularity” and “Gratuitous Evil and a God of Love”, respectively, and readers can look at posts that I did on these chapters here and here. And I think all of the chapters in this volume are quite good and the arguments are timely and intelligent – these are men on the “front lines” so to speak. For the most part, I concur with the ringing endorsements on the back of the book from Christians of various denominations. You can read the foreword and introduction here. That said, this book also helped to clarify in my mind the difficulties I have with the typical Lutheran apologetical approach and helped me to create the previous series of posts where I attempted to put some of John Warwick Montgomery’s arguments in a stronger frame (see the introduction and part I, part II and part III). What follows is basically that same argument from a different angle, and condensed a great deal. In the background of every book about apologetics in general, and every Lutheran book about apologetics in particular, are questions about the role of reason, or argument, in the evangelistic task. In other words, the Holy Spirit works with us as we speak the plain truth – revealing to persons that some of their objections to the Christian faith cannot be substantiated. With their case weakened, perhaps more openings for hearing Gospel truth – faith-creating truth – are created. We can’t “argue someone into the faith”, but with the Spirit, we can at times destroy their arguments and shake their fleshly confidence. “…To ask whether Jesus existed, or whether he publicly claimed to be God incarnate, or whether he rose from death to establish that claim is not at all to ask an esoteric ‘religious” question such as, ‘what is the sound of one hand clapping?’ It is to ask a question about objective, historical facts. Again, here it is time for us to ask how certain words are being used. “Established” – what does this mean? Does it simply mean to pile on more proof – as it seems appropriate to do so – that the unbeliever is responsible for acknowledging? Or are we talking about establishing the facts for the unbeliever that they might be persuaded to believe the Gospel? (while I do not deny that such arguments may “improve the acoustics” such that an unbeliever might be willing to hear more, this would be because they have been somewhat convicted by the Holy Spirit of the truth – the truth that there is much that they are, in fact, suppressing as regards God**). Here is the key point: are not the glorious facts of the Gospel acts already established, or proven? Is it not our role to help persons to see – through conviction of sin and enlightenment by the Gospel – that this is objectively the case? After all, has not God spoken through eyewitness testimony and the continual historical testimony of reliable men? Again, my thought, in sum, is this: while not denying that the methods used by modern historians are capable of establishing among them and the wider public facts and even meanings (in a limited sense) that are not liable to be disputed, what should prevent us from simply saying that the eyewitness testimony itself we have access to – passed on by reliable men (and recorded as the Holy Scriptures for its safeguarding) is not only our evidence, but our proof? (it is not “the proof” however, but “a proof” as I will discuss more in my upcoming series on the internal testimony of the Holy Spirit) And that God Himself has already established this? It seems to me that the fine essays in this volume are not to fall not in the category of “establishing” certain foundational facts – for the historical testimonies that we know from reliable men God has provided do in fact do this – but they fall more into the kind of framework that Dr. Veith provides in his insightful opening paragraph. Again, it seems to me that there is a kind of uneasy tension that exists in Maas’ account. 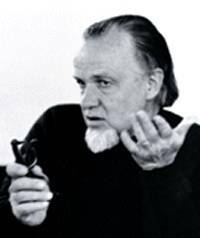 We are in fact left with the unworkable fact-value split – the “two-storied universe” that Francis Schaeffer emphasized, and that satisfies nobody (see this recent post from Daniel Deen at 1517: the Legacy Project where he critiques the fact-value split from a different angle). Nobody that is, except perhaps those who, in an attempt to remain relevant and/or have a bulwark vs nihilsm look to Plato for an assist through Kant and/or other Enlightenment figures (see part I of the Montgomery series). To drive home my point (hopefully not ad nauseum), I submit that, in theory, if we had nothing else besides the eyewitness testimony that has been passed down to us by reliable men – aided by the presence of the Holy Scriptures as well – that would be more than enough. As concerns the matter of the resurrection of Jesus Christ for example, we know that these things, as Paul says, are true and reasonable (Acts 26) – they are God’s proof to all men (Acts 17) – for they “did not happen in a corner” (Acts 26), “as you yourselves know” (Acts 2:22). The testimony of God’s reliable eyewitnesses – entrusted to and passed down in time from reliable man to reliable man – simply demand to be taken seriously in themselves. Again, it seems to me that Christian evidential apologetics in general and Lutheran evidential apologetics in particular fall down in failing to deal with these issues, which Kierkegaard, for all of his faults, could have warned us about (see here). Do we not need to spend time looking at “bare-bones” apologetics – and to see clearly what God, not the world, insists is proof? Lutherans like to utter a lovely shorthand phrase “God doesn’t need your good works but your neighbor does” – and there is no doubt that this new book above may be particularly helpful to you as you look to love your neighbor with God’s strong love. This said, I also think it does us well to re-emphasize that, when it comes to convicting our neighbor of sin that they might be ready for Christ (see John 16: 8-11) we do not need to provide our own answers or proof precisely because God already done that in Christ! So is the book bad? No, I am just suggesting reading some of the essays in particular with the above firmly in mind. Thinking critically in a biblical kind of way. Again, particularly for the reasons given by Gene Veith in the quotation above, I am abundantly thankful for this book and the good work that these men have done, utilizing their reason for the glory of God and His Christ. Insofar as we are able and given the opportunity, we should indeed, like the Apostle Paul, seek to engage our neighbors about their beliefs and to intelligently address their questions, concerns, objections, etc. Loving one’s neighbor demands that each of us, as we are able, do just this. In short, this book enables our proclamation of the Lord’s deeds for us and our salvation to be fleshed out to an even greater degree. It helps make it possible for the assuring story that we love to hear – of God’s work in time in Christ – to not only be told again and again, but to be told in even greater detail (for those who have explored these questions – out of doubt, simple curiosity, or both – have given us more information firmly showing how God’s history and man’s history go hand in hand). For insofar as we receive those words as faith-filled children, we love to hear the story – the glorious meaning of the facts of the Gospel acts. *It does us well to remember that here, at the very least, the Apostle Paul was dealing with persons who believed that the Old Testament Scriptures were authoritative and from God – even if they believed them wrongly. ** See part II in the Montgomery series. Some may suggest that it is not the Holy Spirit who is guiding us “when we’re debating some convoluted point using evidential apologetics. 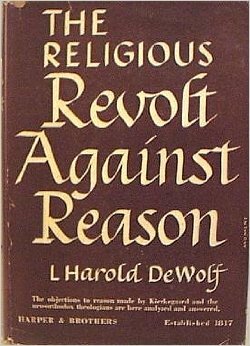 At that point, I think we’re using God-given reason, not an inspired argument of some sort.” (as Lutheran apologist and layperson Scott Diekmann mentioned to me when I shared this post prior to publishing it). My response is that God can guide us in using our reason as well – to bring up good evidentialist points (or other arguments) when appropriate to the conversation. *** Interestingly, in Maas’ short article from the April 2014 Lutheran Witness, adapted from the introduction of this book, this last sentence does not appear while the “in theory” ones do. Because of this I think the short article for the LW is basically perfect – a very nice short summary! **** With this approach, for example, knowledge of one’s family history (or simply of one’s spouse for example!) that cannot be proven to the satisfaction of this historian (physical proof or documentation?) cannot really be called knowledge – especially not public knowledge! ***** Note that this is why I have been so critical of what I have called the MSTM, or modern scientific and technological mindset (see, for example, here and here). I note in passing that Plato, for all of his cultured sophistication, believed understanding the universe ultimately came down to mathematics – and the man had little time for any “truths” poets, for example, might utter. ******* Let us note that this is not about what approaches seem most successful at reaping in numbers (see Acts 17:32), but which are faithful to God’s designs. “History became legend, legend became myth…” – but not for him. In the recent and controversial Noah movie the character Methuselah, the oldest living man in the Bible, made an appearance. In the film, he is shown not only as strange shaman-type figure, but as the man who remembered, and could relay, what had happened from the very beginning. While the film gets much wrong, it does get his ability to do this – by virtue of his age and experience – right. LC-MS President Matthew Harrison on reliable testimony. “I had the pleasure of preaching the 150th anniversary of St. John’s, Corcoran, Minn. As I was preparing for this occasion, I learned that the founding pastor was—you guessed it—John Fackler! Imagine my surprise when, at the luncheon after the anniversary services, I met Myrtle Klemp, who, still spry at 99 years of age, told me, “I was baptized by Pastor Fackler! I knew him well as a child.” Amazing!…. My father-in-law is 90 years old (a decade younger than Myrtle). He was born in 1924. Transposing this century onto the first, Jesus would have begun His ministry in 1930, was crucified and risen in 1933. My father-in-law has vivid recollections of events from the late 1920s. He is also a WWII veteran and remembers helping to liberate Paris, returning home for a brief furlough after victory in Europe and preparing to ship out to the Pacific when the atom bomb was dropped. In this year of 2014, there are people all around us who are completely cognizant of events from 1930. Myrtle has vivid memories from before 1920! If I were to assert that the first resident pastor of St. John’s Corcoran had been a thief or a drunk, a man who pastored that church in its early years, Myrtle would vigorously assert by personal experience that such an accusation is completely false. Yet no one from within the Christian community took it upon themselves to write a refutation of the events recounted in the Gospels or Acts or even St. Paul’s letters. Yes, there were some kooky Gnostic writings that were obviously spurious and written by individuals in heretical communities, most written well beyond the lifespan of actual eyewitnesses. But no legitimate insider wrote something that said, “Hey, folks! I was with Jesus! I knew Paul! And these Gospels and letters of Paul are bogus! 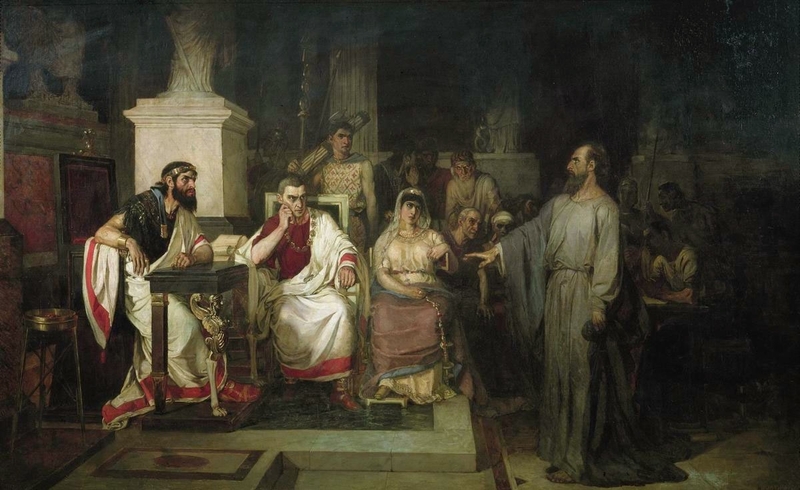 It didn’t happen that way!” In fact, the essential criterion for acceptance of a New Testament document by the Church was whether or not it was known to be the product of an apostle or directly based upon apostolic witness (e.g., Luke/Acts). A final thought about all of these matters. 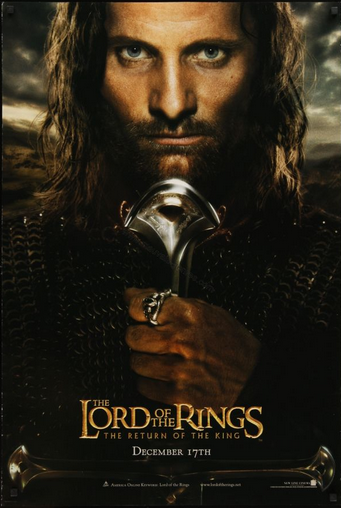 While I, like many Christians, find parallels in the Lord of the Rings stories with the Bible, I always come back to the fact that there is no prayer in these books. For all that it may have in common with Biblical themes – and Tolkien made it clear that this was not meant to be like Lewis’ Narnia – there is no prayer much less “prayer without ceasing”. *** As with Plato’s deity, there are hints of a mysterious Providence, but nothing really akin to Personal God who is able to be known, loved, depended on. How different it is with what is in fact the Greatest Story Ever Told – where God, though His Holy Spirit, has not only provided a chain of reliable messengers to pass it on, but has sealed it in His own written word, and enscripted us into His service to continue in its train – as it carries us, and the world, with it. Whether with joy or sadly, reluctance. May we all look with anticipation to the Return of the King! Come Lord Jesus! *In like fashion, there are echoes of the true history in our world – echoes of the historic space-time Fall and echoes of the Promised Deliverer – the “True Myth” as C.S. Lewis said. 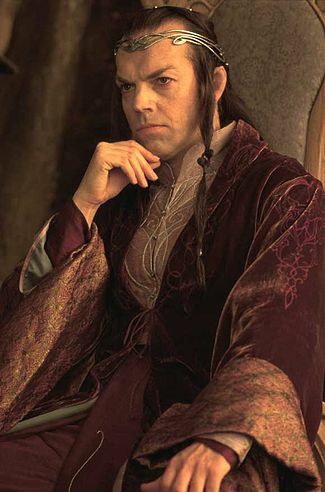 Who knows how many there have been who are like Elrond – perhaps like Melchizedek – have been raised up and supported by God throughout the ages? ** Interestingly, the news of Jesus Christ’s life and resurrection can be contrasted with the message of Genesis 3 in particular, with it’s account of judgment and promise. This would have been “front page news”, and events that would have been potentially knowable and accessible to every man, woman and child on earth. The resurrection, of course, was more local news, and news, it seems, that many would have tried to keep hushed up. 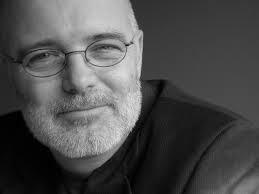 Good, Right, and Salutary Certainty vs. Brian McLaren, “Bible 3.0” and Protestant Confessionalism? 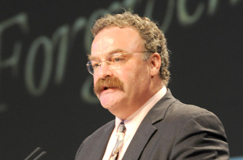 What hath Brian D. McLaren in common with Karl Barth – and most Reformed theology? Or no? 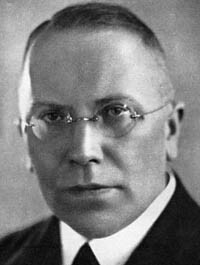 The issue of certainty – particularly as it regards the certainty of one’s salvation – has always been a monumental issue for Lutherans (read here). This is one reason why Kierkegaard, for example, discussed in my last post, does not adequately represent the Lutheran tradition. Kierkegaard wrote a lot to make persons doubt their Christianity, but not much to give them certainty about it…. “Good grief, I thought – what kind of impression have confessional Lutherans been giving?” Lumped in with Arminians and those who have no certainty of salvation in an otherwise superior apologetics textbook! (I have run into this issue in the past, but I was not aware of how widespread this misconception is). On the other hand, Boa and Bowman say that “Reformed theology emphasizes personal assurance of salvation based on the certainty of God’s sovereign purpose and his promise in Scripture…” (p. 494) That might be the case, but there are good reasons for questioning just how assuring this assurance is (see here for a short post summing up my amazement at the positions of Roman Catholic Andrew Preslar and the Reformed apologist Steve Hays). From our side of the fence, let me be very clear: Lutherans insist that we can be certain – should be certain! – that we are in a “state of grace”, or that we are at peace with God (Rom. 5:1 and I John 5:12-13). And so now, in the context of this apologetics textbook, we begin talking about certainty regarding one’s theology as well. Today, it is generally held that Christians of all stripes who take the Bible seriously should not be too tenacious in their own commitments. Children of Immanuel Kant all, when we discuss the Bible we are supposed to talk about our “perspectives” on the text. We are not supposed to say things like “this is what the Bible actually says”, or, “what my church teaches is true” or, perhaps the biggest no-no of all: “by virtue of our doctrine, we are the church”. What is different about this era, that is key to Bible 3.0, is the fact that everyone can now be involved in challenging not just what the Bible says, but the way we have traditionally understood what it says. “It’s not just that it’s being challenged and contested, it’s that everybody knows it is being challenged and contested.”…. ….The very fact that so many people are now aware of how many different interpretations there are of single passages or entire books of the Bible is helping to move us into the era of Bible 3.0. Under Bible 3.0, he says, it doesn’t matter that the Bible is inerrant, because so many us derive completely different meanings from the same inspired, inerrant texts. 20th century Lutheran theologian Herman Sasse: “A church without patristics turns into a sect.” Has the confessional age for Lutherans also come to an end? See here. And this brings me back to the first quote from Boa and Bowman as I think there is a potential problem with what they say. While on the one hand we can talk about our knowledge being “partial, imperfect, and held from a limited point of view” we should be more ready to talk about how it can also be sure, certain, and true – even if mystery remains and our knowledge has not been brought to its completion. As Luther said, the Holy Spirit is no skeptic. This will be challenged of course, but the Lutheran Reformers – and it appears some of the very first Reformed confessors (again see the Harrison post mentioned above) – took this kind of approach for granted. And I suggest that it is precisely because of this stubbornness – faithfulness – that they were able to hold the line and preserve the heart of the Gospel against Rome who would make such certainty null and void. And further, it is also because of this point of view that we can have good reasons for explaining how it is that Christians exist even in what we have called “heterodox” churches: because wherever the clear words of the Gospel are preached – drawn from the pure well of the Holy Scriptures – persons will be brought to faith in him. I would suggest that this whole idea of surety and certainty is not a modernist point of view, but an ancient Christian point of view. Kierkegaard: the arguments against Christianity arise out of insubordination, reluctance to obey, mutiny against all authority. Just the other morning (when I wrote this) my just-turned-two-year old got up early, presumably to hang out with me. He didn’t talk much (never does) – seemed clear to me that he just wanted to be with me. To be in my presence. Before leaving for work I returned him to his mother in bed, gave him and her a kiss, and said goodbye. He just seemed to be taking it all in. God designed life to be based on love, trust and character. Insofar as our modern scientific ideas, methods and “successes” necessarily take us away from these things we are only poorer. While I think the Great Dane was definitely on to something here, I would question whether or not doubt and insubordination can be so finely distinguished. The early 20th century Lutheran theologian Francis Peiper was always pointing out the sinfulness of doubt, and warning us not to excuse it. Further, Jesus notes that anyone who puts His teaching into practice – note not those who don’t – will find out whether it comes from God. “Away with all this world history and reasons and proofs for the truth of Christianity: there is only one proof – that of faith. If I actually have a firm conviction (and this, to be sure, is a qualification of intense inwardness oriented to spirit), then to me my firm conviction is higher than reasons: it is actually the conviction which sustains the reasons, not the reasons which sustain the convictions” (JP 3608, 3:663, in Boa and Bowman, 387). 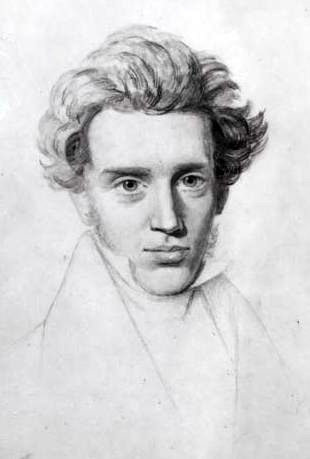 [Kierkegaard says that] “Faith’s conflict with the world is not a battle of thought with doubt, thought with thought… Faith, the man of faith’s conflict with the world, is a battle of character” (JP 1129, 2:14; cf. 1154, 2:25). [He] quotes with approval Pascal’s statement, ‘The reason it is so difficult to believe is that it is so difficult to obey” (JP 3103, 3:418). In this, I submit that what was fought for in the Reformation – the possibility for all those with frightened consciences to know that they are at peace with God – leaves the building. Trust makes love grow, and along with this, trust does indeed become insurmountable loyalty. What theologians like Bloesch, and Barth [and Bonhoeffer] – and it seems Kiekegaard as well – do not understand is that while the Scriptures can talk about faith in terms of obedience, the fundamental ground of faith – something we never get past – is simple child-like trust. In spite of the sin that persists, little ones cling to their parents when they are with them, when they tell them they love them, and when they forgive them time and again, covering their sins. So it is to be with us and the Lord. With seventy-times seven forgiveness, His mercies are new every morning, and we – in spite of the evil we know, fight, and desire to put down forever – may rest in peace in His presence. “Faith is obedience…..” Again, in some contexts, this kind of talk is acceptable, for Scripture itself speaks this way. But in other contexts, the first Reformers recognized that such words can be doubt-inducing and faith-destroying. Eager to counter a nominal Christianity which is moralistically and therapeutically deistic (again, back then “respectability” was often the term of choice to deride such false forms of Christianity) and hastily feigns adherence to creeds, here we see overcompensation again, and a basic failure to rightly distinguish God’s Law and Gospel. God’s work in history – the benefits which come to us today as He speaks hearty words of Spirit and life – is for each one of us! His blood is “given and shed” for us. The benefits of the baptism He underwent at the cross become ours as we are baptized – through water and the word! – into His death. His words “your sins are forgiven”, “peace be with you” are applied to us personally through those He has ordained – both informally and formally – to meet us in our time of need, broken in our sin. Again, these facts – these truths – are found in the transforming words of the Holy Spirit testifying to Christ and with Christ: “my words are Spirit and life”…. “man [lives by] every word that proceeds from the mouth of God”… “the word of the Lord stands forever”. If these are not glorious “timeless truths” for us – since God has in fact and does in fact reveal them to us in time – they are certainly truths we know – or should know! – to be permanent and dependable. “If one were to describe the whole orthodox apologetical effort in one single sentence, but also with categorical precision, one might say that it has the intent to make Christianity plausible. To this one might add that, if this were to succeed, then would this effort have the ironical fate that precisely on the day of its triumph it would have lost everything and entirely quashed Christianity” (Boa and Bowman, 349, emphasis Kierkegaard’s). Again, he is on to something. I also have been pointing out that is we are going to use arguments based on probability, we need to be very explicit about how these are not the main things we want to talk about (see here). We want to deal with certainties – not in the sense of Rene Descartes – but in the sense of what Martin Luther highlighted. With his resurrection and ascension Jesus is hailed as the world’s rightful King and vindicated in all he said and did. “I do not think Kierkegaard would be happy, or would agree, with that which has developed from his thinking… what he wrote gradually led to the absolute separation of the rational and logical from faith.” — Francis Schaeffer, in Boa and Bowman, 450. All our modern epistemological angst aside, according to the Apostle Paul, this work of God through Christ in history is what God calls assurance, or perhaps better, proof. *** This “apologetic”**** from the Lord’s apostle himself (and I don’t even think any liberal Bible scholar has suggested Paul did not say these words) does not deal with making any historical case for Christ based on probabilities. It seems quite clear to me that this is the kind of “apologetic” we should often be eager to present and let linger. *Undoubtedly, knowledge is found in commitment by the knowing subject as he seeks to know. That said, the knowledge found in commitment begins with God’s commitment towards us – and our passive reception of His gifts! Here, we would want to emphasize that as persons takes good words to heart and reflect on their content, God’s Spirit grants both repentance and faith, transforming them and revealing to them that these words are true for them personally. The content of the creeds is for you. **On the other hand, he does quote approvingly P.T. Forsyth, in a quote that seems a bit more reasonable and careful: “We have not two certitudes about these supreme matters produced by authority and experience, but one, produced by authority in experience; not a certitude produced by authority and then corroborated by experience, but one produced by an authority active only in experience, and especially the corporate experience of a Church.” (quote in Boa and Bowman, p. 388). This reminds me of one of the interesting assertions of the early 18th c. idealist (the first idealist perhaps – Kant’s version of this coming later on is quite different), Bishop George Berkeley (who UC-Berkeley is named after today). While clearly radical in suggesting that there was not material world which formed the perceptions/ideas in our minds, he did say “of these ideas that we perceive their essence is to be perceived” which rightly takes into account and assumes God’s design of the world and His purposes in the world (as opposed to materialisitc views of the world that do not presume this ; surprisingly Berkeley, who never did say “to exist is to be perceived” was not seen as a rationalist but a kind of empiricist [though a radical one] – see more here). In any case, here is where Lutherans are keen to emphasize the objectivity of justification (the good kind of “objective justification” – see here), in order to make sure that the comfort found in the fact that “God justifies the wicked” (Rom. 4:5-8) is not denied. For in the terrors of conscience, we do indeed know ourselves – rightly so! – to be those who violate God’s Law in wickedness. If we look at passages like Acts 17:31 in this way, we can then see that Paul’s announcement that Christ’s resurrection from the dead is “proof” can be pure Gospel not only in the sense that the Lord will save us and deliver us from our enemies by judging them, but also by doing what Bombaro says: liberating us from the madness of trying to find God on our own. This is another powerful point, and I think is fatal to some, but not all, forms of evidential apologetics. *****Paul is not so much giving a defense of the Christian faith as much as he is trying to actively share the Gospel in thought-forms that would resonate with his Greek audience. It makes sense to see this speech as connected with apologetics though, which deals with matters of evidence (I John 1), reasoning (I Peter 3:15-16), persuasion, proof (Acts – to both Jews and Gentiles) etc…. – whether one talks about defense or “offense”.